The attempt to make my own sauerkraut resulted in complete and utter failure. Oh, I suppose I could have scooped out the moldy bits and let the cabbage keep on fermenting but I have to admit, the smell that permeated the house was getting to me. And, would it have been safe to let it mold on and then attempt to eat it? I don’t think so. So it’s back to purchasing sauerkraut at the store from people who actually know what they’re doing. Thank you Frank’s for doing what others can not (or will not). Early preparedness is a sham. You know it’s true. 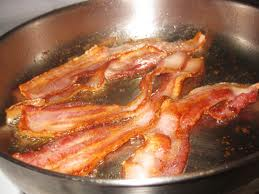 Yesterday I fried up some bacon so I would have that tasty grease to fry liver in. (Yes, I like liver.) And the bacon, I thought, would be awesome for my Monday lunch at work, a BLT. After the bacon cooled I wrapped it up in a paper towel, put it in a baggie, then put it in the fridge so it would be ready for Monday morning. This morning. 6:15ish a.m. I prepped the other BLT bits. The lettuce was shredded, the tomato cut, onions and yellow pepper were added for flavor. Into their containers they went. A large dollop of mayo was plopped in its own container. The bread was lightly toasted. (It and the bacon get warmed in the microwave. Not as good as fresh at home, but palatable.) 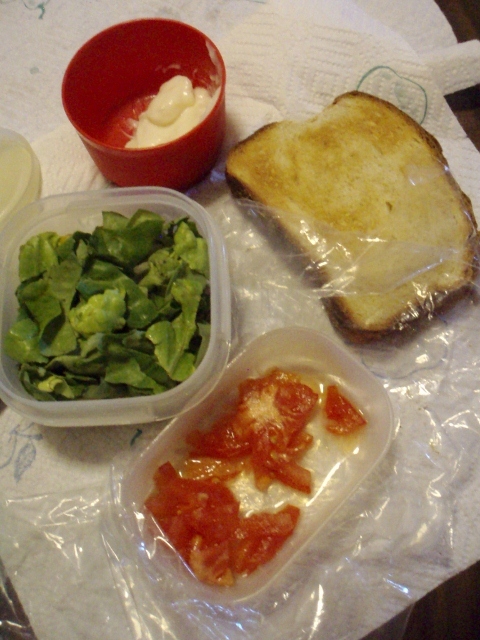 Once the toast was cooled and wrapped everything was tucked into my lunchbox. Work. 11:00 a.m. My stomach growls. It wants to be fed. The brain tells it that it can wait an hour to eat. The stomach growls in disagreement. The brain stops. Oh, no! The bacon is still in the fridge! “I am so stupid.” I say aloud. My space mate, used to hearing these sorts of comments on occasion, turns and waits for the explanation. I explain and she laughs. I laugh. “Guess it’s a veggie sandwich today,” I say. The stomach growls in despair. A veggie sandwich? Urgh. It’s just not the same. Lettuce, onion, pepper and tomato on lightly toasted bread is not a meal. It’s a desperation. No, a BLT is what was wanted. 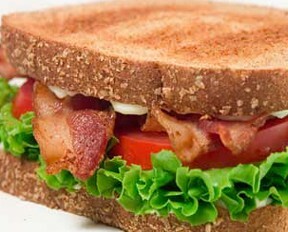 A BLT; that lovely, hot, greasy, hickory-smoked bacon spread across a plain of lettuce, tomato, onion and pepper. The bacon is the crunch, the “mmmmm”ness of a BLT. Without the bacon all you have is desperation. I’m a member of a CSA (Community Supported Agriculture). This means that every week I get a box load of vegetables, herbs and the like. Last week we received our first box. Within it, the garlic scape; a tasty bite of mild garlic flavor. 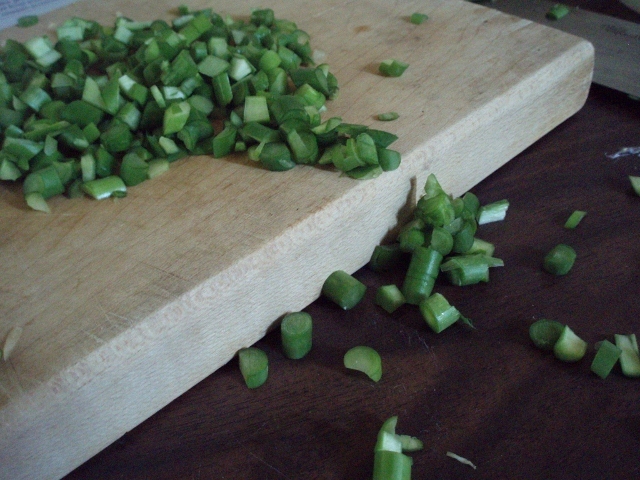 As I was cutting some of them up this morning they kept falling off the cutting board and rolling across the table. All I could think was “It’s the great garlic “e”scape!” Come on, it’s funny.